A single bad panel reduces the string output leading to lost revenue if not detected. Install smart combiner boxes to compare every string and create an alarm if one string is significantly below the others. Maintenance staff can download a string layout saved from the original design drawings. Locate the string location from the displayed ID and drawing orientation. Quickly identify and fix the problem cause. Verify the string returns to full normal output before leaving the site. Eliminate guesswork saving troubleshooting time on a roof with hundreds of panels. A wireless tablet at the site helps an EPC speed up commissioning and customer signoff by demonstrating that every string is working properly. The smart combiner peak recorder saves the maximum output current with a timestamp showing if panels reach their rated output under all conditions of irradiance and temperature. It is hard to tell whether panels are meeting their published specifications under real conditions because the irradiance and temperature constantly change. The smart combiner peak recorder saves the maximum output current with a timestamp showing if panels reach their rated output. Reset the peak recorder any time to start a new measurement interval. 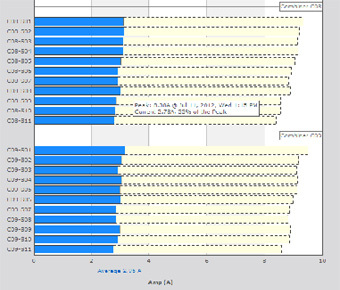 Compare output now (blue) to the peak output (yellow). Check that the peak output of every string reaches the specified rating to easily identify if any panels are not performing as expected. 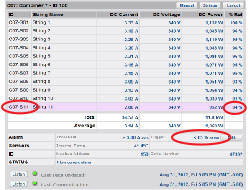 Use the smart combiner option to monitor the output from every string under varying weather conditions. By knowing that every string is delivering the expected output at all times, periodic manual current metering checks are not required reducing expensive on-site labour costs. The highlighted red alarm shows string ID C07-S11 is 84% of the maximum string, below the user alarm trigger set at 85%. This generates an email alarm if enabled. Download the layout drawing to quickly find and fix the problem.